This report examines the performance and economic role of international tourism sector in the OIC member countries in the latest five-year period for which the data are available. In so doing, the report analyses the major indicators, which are traditionally used in measuring international tourism, i.e. international tourist arrivals, international tourism receipts and international tourism expenditures. The report also attempts, as much as the available relevant data allows, shedding light on the state of intra-OIC tourism. 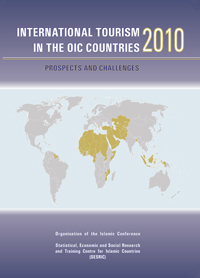 The analysis is made at both the individual country and the OIC regional levels. The report also highlights the impacts of the global financial crisis of 2008-2009 on international tourism sector worldwide. In its conclusion, the report sheds light on the challenges of tourism development in the OIC countries and the issue of tourism cooperation among them and proposes some recommendations to serve as policy guidelines.